Hormonal acne refers to acne caused by imbalance between male and female hormones, androgen/estrogen balance. Androgens boost sebum production and skin cell growth, which leads to blocked pores and acne. Contrary to popular wisdom, having acne doesn’t mean your testosterone levels are too high. Only 15 to 40% of women with acne have abnormally high androgen levels, and having higher testosterone levels doesn’t automatically mean worse acne. 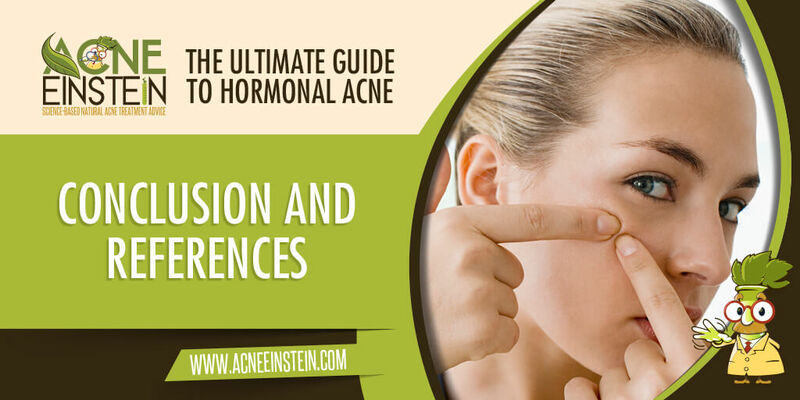 Most of the acne-causing hormones are produced in the skin, which has all the enzymes required for converting various precursor androgens into testosterone and DHT. These locally produced androgens stimulate oil production and skin cell growth. One of the most consistent finding among studies comparing hormone levels between women with and without acne is that those with acne have higher levels of androgen precursor hormones (usually DHEA). Studies on the past two decades have consistently shown that eating less foods that spike insulin levels reduces acne. Insulin is a hormone your body uses to burn and store sugar from the carbohydrates you eat. Cells burn glucose (sugar) for energy and insulin is the hormone that takes glucose from the bloodstream into the cells. Insulin affects how eagerly the skin converts precursor androgens into testosterone and DHT. Insulin also stimulates the adrenals to release more androgen precursors. To put in other words, insulin boosts the production of acne-causing hormones in the skin and provides the skin with more raw material to make those hormones. This explains why reducing insulin levels cuts acne, and why I call insulin as the cornerstone hormone in acne. Estrogen protects against acne by blocking the acne-causing effects of androgens. Studies show that women with acne tend to have lower estrogen levels than those without acne. Furthermore, menstrual acne happens at the time of the cycle when estrogen levels plummet and progesterone levels increase. Some websites promote the idea that a condition called ‘estrogen dominance’ causes acne. Allegedly, women with estrogen dominance have too much estrogen in relation to progesterone. I haven’t been able to find any scientific evidence to support this idea, and all the currently available evidence points to estrogen protecting against acne. A successful treatment plant for hormonal acne has three goals: reduce insulin levels, reduce androgen levels (especially among women with higher than normal levels), and reducing conversion of precursor androgens into testosterone and DHT. Diet – reduce sugars, processed carbohydrates and dairy products. Androgen blocking drugs or supplements – Such as spironolactone, birth control pills and spearmint tea. Insulin reducing drugs or supplements – Like metformin, cinnamon or apple cider vinegar. Topical DHT blockers – Such as green tea or oils with lots of gamma linoleic acid (borage, evening primrose, grapeseed oil).